Some people might be able to take a wild guess at what WTV means and get it right, but don't feel bad if you're not one of them! 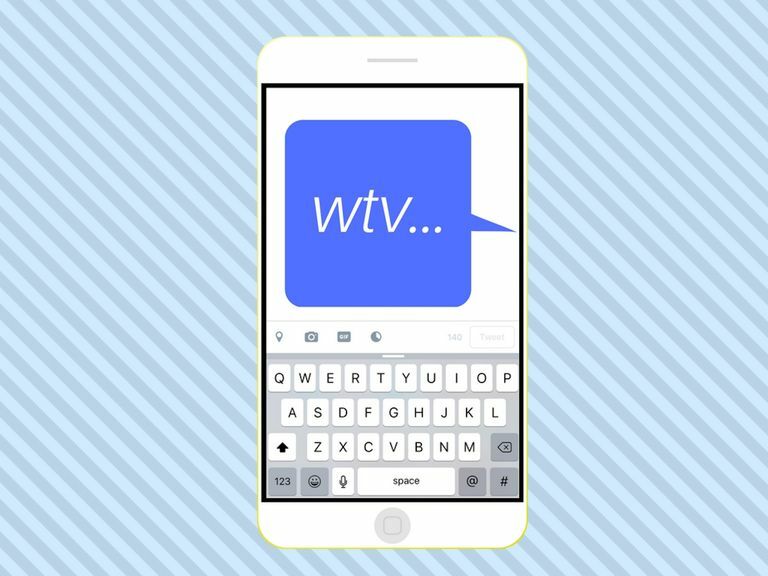 Yes, that's it — WTV encompasses just a single word. It's short enough to type out quickly, yet contains enough letters to be interpreted relatively easily. Friend #1: "Hey do u think I should wear my blue romper or green skirt with white blouse tmrw?" Friend #2: "Wtv. They both look good." In the first example above, Friend #2 uses WTV as an indifferent response to a question asked by Friend #1. Friend #2 might have resorted to using WTV because they were either unable to make a decision based on what they already know or they simply didn't care enough to make a decision. Friend #1: "SO disappointed. You really weren't thinking at all, were you? Smh..."
Friend #2: "No, I wasn't, but wtv u want me to do to fix it, I'll do it. Cuz I know I really messed up." In this second example, Friend #2 uses WTV to express that there are no restrictions or limitations to what they are willing to do to fix a problem for Friend #1. Friend #1: "Are you bringing long pants and a jacket for the trip?" Friend #2: "Yeah, it's prob a good idea to come prepared for wtv the weather might be." This final example shows how Friend #2 uses WTV to refer to the unknown state of the weather. WTV is just one way to say the word whatever. Here are at least three other acronym variations that are just as popular — if not more — than WTV. WTVR: This variation adds an extra letter (the "R" at the end) to make the acronym even easier to interpret. WTR: In this variation, the letter "V" is swapped out for the letter "R."
W/E: This slang term takes the first letters of the two separate words "what" and "ever" that make up the word "whatever" and separates them by a forward slash. Similar slang terms include W/O (without) and W/ (with). Meh is another internet slang term that has a very similar interpretation to WTV — a verbal shrug used to express indifference. If you're using WTV to express indifference, it can almost always be used interchangeably with Meh. Example: "Meh, I really don't care what we do," versus "Whatever, I really don't care what we do." However, if you're using WTV to refer to something unrestricted/unlimited or something unknown/undefined, switching it up with Meh won't make sense. Example: "Whatever you want to do is fine with me," versus "Meh you want to do is fine with me."